These rolls are amazing! They are so soft and fluffy and they have the perfect combination of garlic, herbs and butter. They would pair perfectly with soup, pasta, salad, well just about anything. They are also very good left over, I just warmed them slightly in the microwave. I have not tried to freeze them, but I am sure they would freeze nicely as well. We loved them and more importantly, both of our kids loved them. I plan on making these rolls a regular item on the menu at our house. I started working with yeast about 5 months ago and I am thoroughly enjoying it. I love the smell of the yeast working in the dough and the smell of the finished product coming out of the oven. It is so rewarding to enjoy fresh baked bread made from scratch and the real secret beauty of it all is that it is really easy! These rolls were super easy and didn’t require any difficult steps. As with all bread, they do require a little forethought because of the rise time, however this recipe is relatively “quick” compared to a lot of other breads. So if you have never worked with yeast, I highly recommend you try this recipe as a starter, you will never regret it! Divide the dough into 10 equal pieces. Roll each piece into a 10-inch long rope and tie into a knot. Transfer shaped rolls to a baking stone, or a baking sheet lined with parchment paper. Cover with a clean kitchen towel and let rise for 45 minutes, until puffy. Preheat the oven to 350° F. Brush the glaze onto the shaped rolls. Bake until set and lightly browned, about 15-18 minutes. Let cool slightly before serving. Yum I love Garlic Knots, once of my favorite things! Lovely. 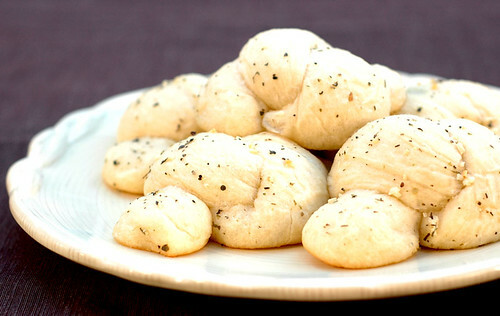 Strange, but I keep seeing recipes for garlic knots lately and I’d never heard of them before. They must be popular. mhm, these look delicious! I am rather new to yeast too and would still like to try some new things – this could definitly be one of them!